An Opinion On Sports: Andruw Jones: In the Tank! 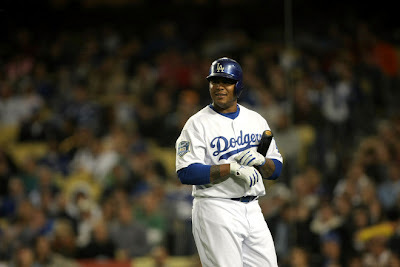 Andruw Jones has a two year $30 million contract with the Los Angeles Dodgers. As of last night, he was batting a cool 'buck fifty nine', with a single homerun and 3 RBIs. He is being booed by the Dodger faithful as mercilessly as one wearing the 'Blue" can be. He is trying to hit every pitch he sees 500 feet. Going with the pitch, using the entire field, and just trying to make contact are not options Andruw is interested in at this point. The only three options "Druw" is interested in are: pull, pull, pull. Hitting coaches Mike Easler and Don Mattingly are putting in extra sessions with Jones. He's been diagnosed, but he hasn't been cured. Don't forget that even though he hit 26 home runs last year, his numbers were down (everyone expected him to have a breakout year in the final year of his contract). He didn't have a great spring, so the start of this season is just a carry over from last year. Speaking of "carry-over", he looks like he just might be carrying a 'few' extra pounds (10+ I believe I read). However, the 10 time Gold Glove winner has shown no diminishing skills in center field. He might not be in a class by himself as a fielder, but it can't take long to call the roll in that class! Perhaps most of the 30 mill was for defense? Whether Andruw's lack of production is due to sickness, slumping, or breaking down at this point in his career won't be determined until later in the year. He has had a remarkable career, so I hope he turns things around and gets the Dodger fans off his case. If he doesn't, they might need those west coast Richter Scales to measure the fall out of a wasted 30 Big Ones! And the beloved Scott Borus won't be able to put this 'Humpty Dumpty' together again.